Feeling almost terminally scruffy, I had my hair cut a couple of days ago (about two months overdue–very short again now) and thought I’d try out some eyebrow threading. Incidentally, did you know what the function of eyebrows is? I didn’t, until I looked for a ‘threading’ link. Apparently they exist to prevent sweat from running into our eyes. Hmmm… clearly they weren’t invented in the North of England, then. To prevent hailstones from slipping down into our eyes? Maybe. Anyway, I looked all smart and shiny again and so took Piglet for a celebratory walk. On our arrival back at home, though, she was so excited that she leapt up and scraped great tramlines down my chin with her claws! (She swears it was an accident, but the cat says she isn’t sure.) Anyway, I now look a bit like a skinhead who’s been in a fight. Not a good look for work, really, particularly since I couldn’t find any concealer. Piggly and I are now off to Waitrose to buy yummy dinner supplies. I don’t like to leave her in the car, but she says she’d rather that than have to stay at home. I’m wearing my Cioch trousers (extremely muddy) so I hope they’ll let me in. The plan is to stop for a walk in the woods on the way back if it isn’t too disgusting outside. Right now I hear gale-force winds and sleet slopping up against the windows, so we may just give the walk a miss. I’d like to get out, though: I like to be wrapped up warmly against foul weather with my little MP3 player and the sight of little Piglet skipping ahead of me through the sandhills. This entry was posted on Sunday, December 20th, 2009 at 2:09 pm and is filed under 09 Food, Walking. You can follow any responses to this entry through the RSS 2.0 feed. You can leave a response, or trackback from your own site. Well! Things have come to a pretty pass. 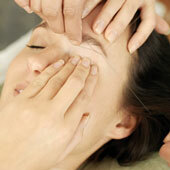 I never, ever, in my wildest nightmares ever thought I would be looking at ‘Eyebrow Threading’ on the interwebbything. Just getting in touch with my feminine side, you understand. I’ll be watching cookery programmes next…. You could try the eyebrow threading yourself! It’s a most peculiar sensation. Not at all what I’d expected. I still don’t look like Nigella Lawson, though 😦 D’you reckon I can demand a refund? Nigella’s used to be a good look but lately she has developed quite a large, curvaceous, or perhaps bulbous …. – how shall we say… following? You don’t want to be going there, Shirl.